Motherhood is so, so wonderful. And also a challenge, but often for different reasons than I thought. Case in point: Milo is going through a phase of throwing cars/hitting people in the head with them. Not ok. But how do you teach a 1 year old that he can't do that? "No no" isn't working all that great unfortunately. He's learning how to test the waters. He'll hold his food over the floor from his high chair with devious eyes just waiting for me to tell him to keep his food on his table. Now this boy is a sweetheart in every sense of the word. I know I'm biased as his mom, but it's true. But this hitting thing is a problem! Trevor and I have talked about the best way to discipline him and teach him things. Being firm and saying "no" is surely preferable. And yesterday we realized we need to be more serious about nipping the hitting in the bud. So when he jacked me in the head with a car, I tapped his hand and said no. It wasn't out of anger, and it wasn't hard, just enough to get his attention. And the next 5 minutes were the saddest of my life. He laid down on the floor and just cried. Like I betrayed him! And then I picked him up and thankfully he just let me hold him and laid his head on my shoulder (if he had run away from me I would have died right then and there). But good grief. Talk about the guilt trip of the century! He cried... I cried... and I felt like the biggest failure of all mothers. 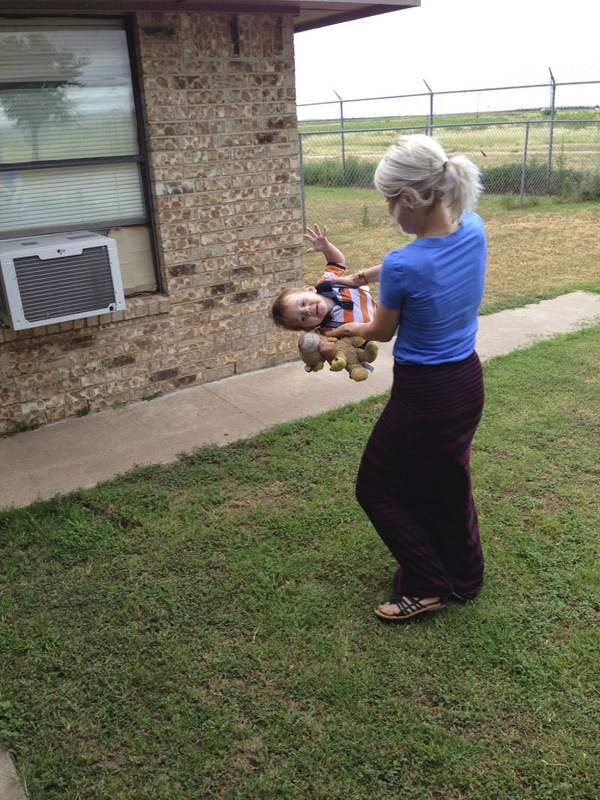 So what do you do when your 1 year old boy is acting like, well, a boy? How do you lovingly and gently teach important lessons without being the bad guy? How do you cope with sometimes having to be a meanie by correcting your child when he's wrong? What's the best way? How do you make sure he knows all along how much you love him? Advice is so much more than welcome. I want my baby to grow up feeling secure and loved and safe and happy, and I don't want him to be entitled or out of control. I want to raise him to be polite and respectful and fun and sweet and good and happy. Is that so much to ask?! :) Teach me mommas... this toddler thing may just be a doozey! Love and Logic is a great series. I learned that NO isn't enough. "WE don't throw cars" (I'm on your side, but it's not okay) "Cars that are thrown go in the time out box" A good line repeated over and over (and over) is needed to make the connection. Consistancy...don't let him get away with it even once or he will hold out hope that it will happen again!